Playa lakes are critically important features of the landscape across much of the western Great Plains. Playas provide the vast majority of the water recharge of the Ogallala Aquifer, tremendous wildlife benefits, and a host of utilitarian, recreational and aesthetic benefits to landowners and society at large. However, playas and their associated benefits are currently threatened by land use management decisions. It is critical to understand the behavioral drivers for both playa conservation and utilization. DJ Case and Associates—with funding from the Great Plains Landscape Conservation Cooperative and in cooperation with Playa Lakes Joint Venture, Rainwater Basin Joint Venture, and a host of other partners—conducted 13 focus groups with farmers and ranchers in six states throughout the Playa Lakes region in late summer of 2013. The goal of this research was to better understand landowner attitudes and opinions about playa conservation (with emphasis on impediments to conservation behaviors) to inform agencies’ strategies to encourage and enhance conservation of playas on private lands. By conducting focus groups with landowners in target areas, researchers were able to focus on issues and topics that emerged in the 2006 survey of landowners in the Playa Lakes region, probing key socioeconomic impediments that discourage landowners from enrolling in conservation programs or restoring playas, and then recommending strategies for overcoming these reservations. Representatives from the Playa Lakes and Rainwater Basin Joint Ventures and their partners coordinated recruitment of participants, with a total of 72 producers who have playas on their land in attendance. The informal and relaxed atmosphere of these smaller gatherings provided particularly penetrating insights for future communications and conservation efforts. In the focus groups, participants provided unique insights into their knowledge, beliefs and attitudes about playas and the socio-economic barriers that often prevent them from conserving playas on their land. Collecting those results has been a critically important first step toward increasing playa conservation and all the ecological benefits that go along with it. However, the results are just that—a first step. Next comes the equally important conversion of those results into strategies, actions and assignments to leverage this new understanding into conservation behaviors—into more playas functioning on the landscape. The most commonly stated positive benefits of having playas on their land included aquifer recharge, wildlife habitat, good cropland/forage (if dry), water for cattle or irrigation, natural flood control, and aesthetic values. The most commonly stated negative benefits of having playas on their land included flooding, getting equipment stuck, harboring noxious weeds, poor yields, poor water for cattle, and decrease in property value. The large majority of participants who were already using playa conservation programs did so primarily because of economics—they felt they could get higher financial return from the programs than they could from farming/ranching. Others did so for wildlife benefits, to rest the land, or for hunting benefits. Landowners who were not currently enrolled in any playa conservation programs said it was because of economics (they thought they could receive higher financial return from farming/grazing playas than they could from the program), it was too much hassle for small pieces of ground, distrust of government programs, or location of playas on the land. Landowners considered the following things as they decided whether or not to enroll in playa conservation programs: economics (does the program offer more money than they can make through farming/ranching? ), length of contract, cost share for establishment, loss of control/rights, who administers the contract, convenience of sign up, and location of playa on the land. If landowners could design a conservation program for playas, it would include fair market value for the foregone income, adjustments for inflation or market changes, variable contract lengths, rotational grazing rights, signing bonus, cost share for establishment, weed control assistance, and other attributes related to local control. Landowners are very concerned about the condition of the aquifer and most are interested in conserving the remaining water. However, there was a wide range of understanding about the connection between playas and the aquifer. A few participants were well informed about the connection, but the majority were unaware of the relationship and/or were skeptical. A large majority of focus group participants said they would be willing to conserve/restore their playas (or at least consider it) to help recharge the aquifer. Of course, it depends on how much recharge would result and many other factors, but nearly all would be open to it if they were convinced it would help the aquifer. Fewer would be willing to conserve/restore playas for wildlife benefits only, but many said they would consider it. Nearly all participants wanted to pass their farm/ranch operation onto the next generation—often within their families, and they wanted to leave the land in better condition than it was when they got it. Very few participants had heard of the Playa Country radio show, but most that had heard of it liked it and found it credible. 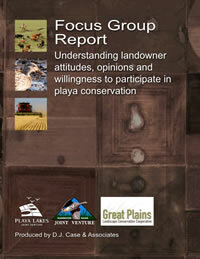 For more information about this research, download the full landowner focus group report.